*Erie, PENNSYLVANIA was just in the radio headlines for the record-setting bid broadcaster Rick Rambaldo and his partners placed for a new class A signal on 92.7 - but even before they can get that facility on the air, another Erie-market FM is poised to put a much bigger signal over the city. Long before Rambaldo was placing bids in the latest FCC auction, he was an upstart broadcaster who bought the old WHYP-FM (100.9) in North East, 20 miles east of Erie, and upgraded the station's signal to reach Erie listeners as "Rocket 101," WRKT. 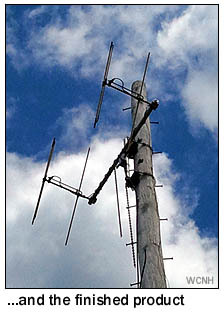 Starting with the old class A WHYP-FM facility, Rambaldo powered the signal up to B1 status (4.2 kW/797') from a tower in Ripley, just inside the New York state line, carefully placed to just clear a host of spacing issues including two powerful first-adjacent signals in Cleveland (WMMS 100.7) and Youngstown (WHOT-FM 101.1). Rambaldo eventually sold WRKT, and now if its current owner, Connoisseur Media, has its way, the station may soon be moving much closer to Erie - and way up the FM dial as well. Connoisseur has applied to move WRKT from 100.9 to 104.9, relocating it from the Ripley tower to the Connoisseur-owned tower site in Hammett Township just east of Erie that's home to sister station WRTS (103.7), whose antenna WRKT would share. 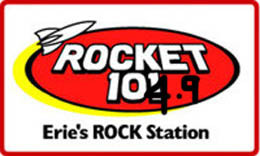 If the move is granted, the new "Rocket 104.9" would become a 4.5 kW/526' class B1 facility, with somewhat less overall coverage than the present 100.9 facility, but with a much stronger signal over Erie itself, which would be blanketed with a 70 dBu city-grade signal from WRKT for the first time. Connoisseur's proposal, which requires Canadian approval, would lead to some other changes on the dial as well: it also includes a brand-new class A allocation on 100.9 in Westfield, New York, which would effectively bring that frequency back to the North East area where it started. (That channel would itself eventually go to an FCC auction.) And it would displace translator W285AI from 104.9 - which would, not coincidentally, be a blow to Connoisseur's Erie rival, Citadel, which recently bought the translator to relay its sports station, WRIE (1260)...which just happens to compete with Connoisseur's sports entry, WFNN (1330). *In other Keystone State news, there's a station sale south of Harrisburg, where Holy Family Radio, Inc. (not, apparently, the Holy Family Communications that does Catholic radio out of Buffalo) is paying $500,000 to WP Pennsylvania Inc. for religious WWII (720 Shiremanstown). An obituary from Pittsburgh: veteran WQED radio and TV announcer/producer Jim Sweenie has died. Sweenie started in radio at WMCK (1360 McKeesport, now WMNY) during high school, then became an actor and an English professor before venturing back into broadcasting at WQED. PBRTV.com reports that Sweenie spent more than four decades at the public broadcaster, serving as a booth announcer, writer, director and producer at WQED-TV, as well as hosting several music shows on the FM outlet. Sweenie died last Saturday (June 4) at 76; he'll be remembered next week with a special edition of his "Saturday Night Requests" show on WQED-FM. Over at Pittsburgh's other public broadcast group, the new Essential Public Media has named Tammy Terwelp as director of content and programming for the soon-to-be-renamed WDUQ (90.5). Terwelp, who comes to Pittsburgh from Chicago's WBEZ, will oversee the format flip that will take 90.5 from a mix of news and jazz to an all-news/talk format, effective July 1. *The political fallout from NEW JERSEY governor Chris Christie's plan to end the state's operation of its NJN public TV and radio networks continues to grow. Christie officially announced the plan last Monday, keeping the NJN TV licenses in state hands but handing off operation of the network to "Public Media NJ," an alliance of New York-based WNET (Channel 13) and Steve Adubato Jr.'s Caucus Educational Corporation, which already produces New Jersey-based public affairs programming for WNET and several other broadcasters and cable networks. Under Christie's plan, WNET and Caucus would pay nothing for the signals, and they'd get to keep the stations' CPB grants (estimated at about $2 million) and the annual income from NJN tower rentals (another $2 million or so). In exchange, Christie says, the state will save the $11 million a year it spends on the service - WNET and Caucus will commit to an ambitious lineup of New Jersey-oriented programming, with 20 hours of New Jersey programming a week, including a nightly newscast that will replace the existing "NJN News" as well as debates and election coverage. In place of NJN's staff of about 120 (60 or so of whom will get new state jobs, with the rest being laid off or retiring), WNET says it will hire a news staff of 15-20 people to provide New Jersey news alongside the station's own existing staff. Those plans aren't sitting well with other New Jersey politicians, including Democratic senator Frank Lautenberg, who met with FCC chairman Julius Genachowski to express concerns about the deal. "It is difficult to see how the loss of such programming is in the public interest of new Jerseyans - especially considering the states lack of commercial broadcast television news access." It's unlikely, however, that the FCC will have much cause to intervene. The agency maintains a strict "hands-off" policy when it comes to program content - and in the case of NJN's TV stations, it won't even have a license transfer to consider, since the state plans to keep the licenses. Where the deal could still run aground is at the state level, where lawmakers must sign off on the change within a 15-day review period that began with Christie's announcement a week ago. During hearings on the proposal on Friday, union officials called the Adubato-WNET partnership an "inside deal," saying the governor had ignored other bids for the station from in-state organizations including Montclair State College. 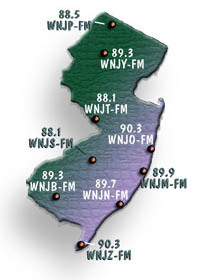 As for NJN Radio, there seemed to be little sentiment about keeping the network, which has never had full-state coverage. Christie does plan to sell those facilities outright, splitting them between Philadelphia's WHYY and New York City's WNYC. WHYY will pay $926,000 (plus $612,000 in "non-cash payments") for five stations serving the Jersey Shore and the state's southern extremities: WNJM (89.9 Manahawkin), WNJN (89.7 Atlantic City), WNJZ (90.3 Cape May Court House), WNJB (89.3 Bridgeton) and WNJS (88.1 Berlin), and it appears the plan will be simply to use those stations to extend the reach of WHYY's existing news and talk service, already heard on 90.9 across much of central and south Jersey. As for WNYC, it plans at least some sort of New Jersey-focused programming on the four stations for which it will pay $1 million, plus $1.8 million in "non-cash payments": WNJP (88.5 Sussex), WNJY (89.3 Netcong), WNJT (88.1 Trenton) and WNJO (90.3 Toms River), serving chunks of northwest and central New Jersey and a northern piece of the shore. *A NEW YORK morning radio veteran is once again out of work. It was just a year ago that John Mulrooney joined Cumulus rocker WPDH (101.5 Poughkeepsie) as part of the "Coop & Mulrooney Show," but now the station says "the time is right to move on from having a four-person show," leaving Mark Cooper and sidekicks Kricket and Deuce in place - and Mulrooney as the odd man out. Mulrooney was probably better known to Albany listeners for his long stint as part of the "Wolf and Mulrooney" morning show on WPYX. *Clear Channel shuffled the lineup on the channels it controls on the XM/Sirius satellite radio platforms last week, bringing two of its New York City signals back to national exposure. WHTZ (Z100) is now being heard on channel 12 and WLTW (Lite 106.7) on channel 13, replacing similar top-40 and AC services that had been programmed out of Clear Channel's national iheartradio formats. The national versions of Z100 and Kiss replace local New York ads with national ads and filler music. Clear Channel says it made the change after seeing how popular those stations (as well as Nashville's WSIX, LA's KIIS and Chicago's WGCI) were with out-of-market listeners streaming them via iheartradio. He's best known for his big hit "Someday, Someway," but now Marshall Crenshaw is trying his hand at radio. Crenshaw will join the staff of WFUV (90.7 New York) beginning next Saturday for a one-hour weekly show called "The Bottomless Pit," which will air at 10 PM, following Vin Scelsa's venerable "Idiot's Delight." Radio People on the Move: Tre is headed back to Florida (WPBZ in West Palm Beach, to be precise) after a stint as afternoon jock and production director at Rochester's WZNE (94.1). No replacement has been named. 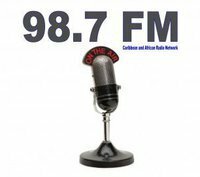 Over in Utica, CNYRadio.com reports that "SportsWatch" is back on the schedule at WIBX (950), now with news director Jeff Monaski and Ray Rich co-hosting. Former hosts Gene Conte and Fred Miller recently departed WIBX to join Galaxy's WTLB/WIXT/WRNY, and the station had been running Sporting News Radio in the 6-8 PM slot in their absence. *There's another new signal coming to CANADA's largest market, on a frequency the CBC didn't want occupied. For almost a decade, Fitzroy Gordon has been battling the government broadcaster for the right to put a new station on the air targeting Toronto's Caribbean communities. With the Toronto FM dial packed full, the only frequency Gordon could find was 98.7, where he believed he could squeeze in a low-power signal right alongside the CBC's CBLA, which broadcasts Radio One programming on second-adjacent 99.1. As far back as 2006, the CRTC granted Gordon a license for a Caribbean service in Toronto, but on the condition that he find a frequency other than 98.7, a task that proved impossible. So Gordon decided to try to prove that the second-adjacent channel would work. Last year, he received Industry Canada permission to test the 98.7 signal, and the results of that test persuaded Industry Canada and the CRTC that 98.7 can indeed be used in Toronto. The CRTC declined to impose a condition requested by the CBC that would have barred Gordon from selling the station, and it rejected a request from competing broadcaster Doug Kirk to delay issuing the license until a civil court resolves a lawsuit in which he seeks an ownership stake in Intercity. As for Gordon, he says he's already starting to scout out studio and office space and staffers, and he hopes to have at least an automated music feed up and running at 98.7 in time for the Caribana festival at the end of July. *To the south, the CRTC has approved Haliburton Broadcasting Group's C$5.5 million purchase of CFLZ (105.1 Niagara Falls) and CKEY (101.1 Fort Erie) from Niagara Radio Group. The sale doesn't include sister station CJRN (710 Niagara Falls), which programs tourist information for the region. *Regular programming has started at Pineridge Broadcasting's new CJWV (96.7 Peterborough), which is running an AC format as "Magic 96.7." Milkman UnLimited reports the new station's airstaff includes Dan Duran and Linda Kash in mornings, Sue Tyler (late of CKQM "Country 105") in middays and Mike Cutting (from sister station CHUC-FM) in afternoon drive. Cutting will also serve as assistant PD. *NEW HAMPSHIRE's independent TV station now has a new identity to go with its new owner. Not at all shy about identifying himself with his newly-acquired station, Bill Binnie has changed the calls of Derry-licensed WZMY (Channel 50) to WBIN-TV. Binnie's Carlisle One Media paid Diane Sutter's ShootingStar Broadcasting $9.25 million for the station, which maintains its MyNetwork TV affiliation even as it drops its "MyTV" on-air identity. "Watch us for great comedy, great drama and watch us change before your eyes!" is the promise on the station's new website. So far, the only new program that's been announced is a Republican presidential debate to air on October 11 in conjunction with Bloomberg News, the Washington Post and Dartmouth College. *There's a new signal testing just south of Concord. 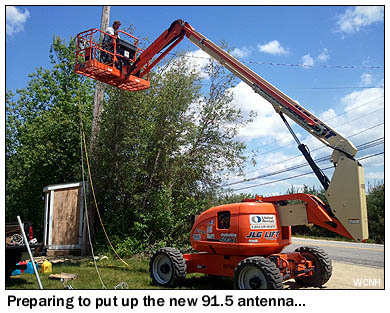 Highland Community Broadcasting, which operates classical WCNH-LP (94.7), put up the antenna for its new 190-watt signal on 91.5 last week. The new full-powered facility is licensed to Bow, and will soon change calls from WCNU to WCNH - and once "Classical 91.5" makes its official debut, the 94.7 LPFM license will be transferred to a new nonprofit operator. *TV news from CONNECTICUT: after a short stint as an affiliate of Retro TV in 2009, independent WSAH (Channel 43) in Bridgeport has once again joined up with the Arkansas-based classic TV network. RTV replaced infomercials in the noon-midnight programming block on WSAH last week. While we're on the shore, we note that the FCC has (at least initially) turned down Sacred Heart University's application to move WSHU (1260) from Westport to Stratford. The Commission says at least a small portion of the new interference that would exist between WSHU and co-channel WFJS (1260 Trenton NJ) would take place over a land path instead of across salt water, and therefore it can't grant the waiver it usually grants when coastal stations interfere over long water paths. WSHU (which has been operating on a temporary longwire antenna since losing its Westport transmitter site a few years back) will get the chance to amend its application to alleviate the potential interference, and we'd expect to see a modified application soon. The FCC has granted the first part of the multi-step upgrade that will shift several signals in Connecticut and western MASSACHUSETTS: Clear Channel and Hall Communications now have construction permits in hand for their coordinated upgrades on 100.9, which will shift Clear Channel's WRNX Amherst to a new site on Mount Tom, closer to Springfield, and will upgrade Hall's WKNL New London to 6 kW (directional) from its present 3 kW class A status. The FCC has yet to approve the other piece of the shuffle, which will shift Clear Channel's WPKX (97.9 Enfield/Springfield) into the Hartford market with a new city of license of Windsor Locks and a new transmitter site in downtown Hartford. Once all the pieces are in place, 97.9 is expected to take on a new format with its move to Hartford, while its present "Kix" country format and WPKX calls migrate up the dial to what's now WRNX. Meanwhile on the FM dial, Costa-Eagle's WNNW (800 Lawrence) is moving its FM translator. W221CH (92.1) has been struggling with interference to and from the Boston Phoenix's 92.1 signals in New Hampshire and Maine, and now it holds a construction permit to return to 102.9, where it will run 97 watts from the WNNW tower in Andover. And here's another reminder: if you'll be in the Merrimack Valley yourself next weekend, don't miss the get-together that Gary Francis is throwing for boston-radio-interest mailing list participants and other broadcast types. The cookout will take place Saturday, June 18 from 2-5 PM (with a rain date for Sunday) - and you can get more information from Gary here. *The FCC has driven another stake into a dead RHODE ISLAND noncommercial station. WRJI (91.5 East Greenwich) squeezed its way on to the air in 2005 when Educational Radio for the Public of a New Millennium reached a time-sharing agreement with Coventry High School's WCVY (91.5 Coventry), which had been operating only a limited schedule on school-day afternoons, putting its frequency at risk for mandatory time-sharing. Radio People on the Move: Hilary Rosenthal is the new music director at WBRU (95.5 Providence), replacing the departing Sabrina Boyd. Where are they now? Former WHJJ (920) talk host Arlene Violet has added yet another chapter to a long and varied career that's included time as a nun and as Rhode Island's attorney general. She's written a musical, "The Family," about the Rhode Island mafia, and it's being performed through July 1 at the Lederer Theater at Trinity Rep in Providence. And we note the passing of Don Hallett, who'd worked at WWLI (105.1 Providence) and WKRZ (98.5 Wilkes-Barre PA) a few decades back. Hallett had been working more recently in Columbus, Ohio and Las Vegas; he died May 16. The Connecticut Tigers of Norwich have a new member of their radio team, as Justin Sheinis joins up to do media relations and call road games, replacing Jon Versteeg in that role. Eric Knighton remains the main play-by-play voice at home, and WICH (1310) returns for a second season as the team's flagship. The Vermont Lake Monsters have segued from former flagship WEAV (960 Plattsburgh NY) to its FM sister WCPV (101.3 Essex NY), now that the former "Champ" has become "ESPN 101.3." Rob Ryan will be back in the booth, and he'll join Rich Haskell to do live broadcasts of the 4-6 PM "Rob and Rich Show" from Centennial Field before weeknight home games. In Massachusetts, The Lowell Spinners continue on WCAP (980) with Ken Cail at the mike. In New York State, fewer and fewer teams seem to have radio deals as the season gets underway. The Batavia Muckdogs weren't even sure they'd be playing in Genesee County this year, but they're back, and back on WBTA (1490) with Wayne Fuller calling the games from the newly-named "Wayne Fuller Press Box" at Dwyer Stadium. The Hudson Valley Renegades lost announcer Nick Gagalis to the independent Worcester Tornadoes, but the team will be back on the air this year at the same spot, the "Hudson Valley Talk Radio" trimulcast of WBNR (1260 Beacon), WLNA (1420 Peekskill) and WGHQ (920 Kingston). The Brooklyn Cyclones stay put on WKRB (90.3), with Warner Fussell calling the games - and there's no broadcast radio this year (at least none we can find) for the defending champions, the Tri-City Valley Cats in Troy, nor for the Staten Island Yankees or the Jamestown Jammers. In Pennsylvania, it's another year of the status quo: the State College Spikes on WWZW (95.3 Bellefonte) and the Williamsport Crosscutters on WLYC (1050). The 'Cutters are also heard on WLYC's FM translator in Williamsport at 104.1 and on affiliates WTZN (1310 Troy) and WTTC (1550 Towanda). And we note that we let the start of play in the independent leagues get past us a couple of weeks ago, so here's this year's broadcast roster, starting with the Can-Am League: in Massachusetts, the Pittsfield Colonials team up with the local high school to put their games on WTBR (89.7), with students working alongside broadcaster Chad Cooper; the Brockton Rox remain on WXBR (1460) with Josh Rogol, and the suddenly-unfortunately-named Worcester Tornadoes go webcast-only with new broadcaster Nick Gagalis. In New York, the brand-new Rockland Boulders air on WRCR (1300), with Carmine Vetrano and Seth Cantor calling the games. Across the border, Les Capitales de Quebec remain on CHRC (800). There's no radio this year for the Newark Bears or the New Jersey Jackals (apart from a low-power FM feed of the team's webcast on 88.1 for in-stadium listeners). In the Atlantic League, only a few teams have radio: the Long Island Ducks are in the first year of their partnership with WJVC (96.1), the Lancaster Barnstormers continue with WLPA (1490), the York Revolution are on WOYK (1350), and New Jersey's Somerset Patriots remain with WCTC (1450). It's been a week of obituaries across NERW-land, including the passing of a radio owner who was a trailblazer twice in his long career. When Andrew Langston came north from his native Georgia to Rochester, NEW YORK in 1960, the idea that he might someday own a radio station was but a fantasy; indeed, even the opportunity to work in radio or television was something of a pipe dream. But by the late sixties, Langston saw that a black-owned radio station was becoming possible, and after many years working in the clothing and insurance industries, he founded Monroe County Broadcasting in 1968 to pursue the dream. Getting a new signal on the air even then was a challenge, involving negotiations with an adjacent-channel signal in Buffalo (what was then WWOL-FM 104.1) and securing the cooperation of Xerox Corp. to place an antenna atop their new downtown Rochester office tower - but in April 1974, Langston's dream came true with the debut of WDKX (103.9 Rochester), a class A signal named for Rochester's Frederick Douglass, Martin Luther King Jr. and Malcolm X. While not the first black-owned independent station in the country (that honor appears to belong to KPRS in Kansas City), WDKX was certainly among the very first. WDKX grew slowly but steadily, and by the eighties it had moved from its original rented studio space down East Main Street to larger quarters in a former funeral home. By then, WDKX had become a major force in Rochester radio, trading airstaff back and forth with larger stations and routinely appearing near the top of the ratings. With consolidation came plenty of offers for Langston to cash out, but even the inflated station prices of the nineties couldn't separate him from his radio station and his community. In an interview with your editor (then with Rochester's R News) on WDKX's 25th anniversary in 1999, Langston promised that the station would pass not only to his son, Andre Marcel (who was by then WDKX's program director) but eventually to his granddaughter as well. Langston not only spurned the advances of the big broadcast groups; he also fended off their attempts to compete for his audience. Remember "Jam'n 107.3?" Not many in Rochester do; that voicetracked urban outlet came and went while WDKX, with its live airstaff and full-service commitment to the community, survived and thrived. While other commercial music stations cut back or eliminated news, WDKX's news operation grew; in recent years, the station has been a frequent partner with other news outlets (including the Democrat and Chronicle, WHAM-TV and WXXI) in sponsoring political debates, community forums and special coverage of big events. In recent years, Langston had handed over most of WDKX's daily operations to his son, who now serves as both president of Monroe County Broadcasting and PD of the station, which remains a proud stand-alone - and a constant visitor to the top of the ratings in town. Langston was inducted into the inaugural class of the New York State Broadcasters Association Hall of Fame; he also received honors from the National Association of Black-Owned Broadcasters and the "Rochester Radio Broadcaster of the Year" award. Langston died on Thursday (June 10) at age 83; he's survived by his wife, Gloria and son, Andre. Langston, sadly, was just one of several good broadcasters the region lost last week. Stew Schantz, who died Friday morning at age 53 from complications during surgery, was a familiar figure on the music-radio scene for many decades. He started out in the late seventies at WPDH (101.5 Poughkeepsie), then moved across town to WSPK (104.7 Poughkeepsie), where he was the PD who launched the "K104" top-40 format in 1980. Schantz also worked afternoons at K104 before moving up to Utica in 1998 as PD/afternoons at WSKS (then on 102.5), where he eventually served as operations manager for the whole Clear Channel cluster. In 2005, Schantz moved over to Galaxy, where he programmed WRCK in Utica and WRCZ in Albany. Most recently, Schantz was operations manager at the Vox cluster in Pittsfield, MASSACHUSETTS, where he also was PD/afternoons at oldies WUPE-FM (100.1 North Adams)/WUPE (1110 Pittsfield). How about some non-obituary news from the Empire State? There was a bit of it last week, starting in Poughkeepsie, where Cumulus rocker WPDH (101.5) has named a new morning show. Last month, WPDH pulled the plug on the "Coop and Tobin" morning show after co-host John Tobin departed amidst a contract dispute; now John Mulrooney's on board with Mark Cooper for the "Coop and Mulrooney" morning show. Mulrooney is better known to the north, in Albany, where he was the longtime co-host of the "Wolf and Mulrooney" morning show on WPYX; he's also worked in New York (at the old WDBZ 105.1) and on TV. Across the state line in Massachusetts, there's another obituary: Tony Cennamo was one of the most prominent DJs on Boston University's WBUR (90.9) in the days before the station went to an all-news/talk format. Cennamo came to Boston in 1967 from New York's WCBS, where he was a producer, to do a talk show on WCAS (740 Cambridge; now WJIB). He moved to WBUR in 1972 to begin playing jazz, and that's where he stayed until 1997, moving around the schedule from mornings to late nights to overnights. (For a brief period in the mid-70s, Cennamo was also heard on WMEX 1510 on weekend evenings.) Cennamo suffered a stroke in 1986 and had more recently suffered a seizure; he died Tuesday (June 8) in a Malden nursing home, at age 76. Fans of modern rock in southeastern PENNSYLVANIA have had a tough time finding a home on the radio in recent years, and last week brought another blow with the cancellation of the "Y-Rock on XPN" programming at public station WXPN (88.5 Philadelphia). "Y-Rock" came to WXPN in 2006 after Radio One pulled the plug on WPLY (100.3 Media), prompting a grassroots "Save Y100" effort among the station's former listeners. WPLY PD Jim McGuinn and several other Y100 staffers came over to WXPN a few months later to inject some modern rock into the AAA format that dominates the WXPN schedule. "Y-Rock on XPN" was heard three nights a week on WXPN's main channel, as well as a fulltime HD2 channel and webstream. The HD2 service lives on for now, as does the stream, but without six staffers who made it more than a jukebox. The layoffs included operations manager Josh Landow, who was also "Y-Rock"'s midday host. No radio owner in MASSACHUSETTS - or pretty much anywhere else, as best we can tell - has been around longer than Maurice Cohen. With his brothers Ike and Ted, he put WCAP (980 Lowell) on the air June 10, 1951. Fifty-five years later, many of the radio people whose careers took them up the long staircase at 243 Central Street (your editor included) returned to Lowell for a combination reunion/anniversary celebration/salute to Maurice. WCAP news director Gary Francis hosted the event at his Gary's Ice Cream shop in downtown Lowell, and former WCAP talk host Bill O'Neill anchored the four-hour live broadcast from the reunion, with Mark Watson at the control board and production pieces from longtime WCAP producer Dan Bourret. Maurice also received honors from several Lowell politicos, including former mayor Rita Mercier, state senator Steve Panagiotakos - and a wonderful front-page mockup from Lowell Sun publisher Kendall Wallace. A lot of fuss for one small-town radio station? You bet - but in an era when so many towns have lost their local radio voices (think of WJDA in Quincy, WESX in Salem and WCAP's Merrimack Valley rivals WCCM, WLLH and WSMN), a salute is in order to owners like Maurice Cohen, who've resisted lucrative purchase offers year after year in order to keep doing radio the way they learned it many decades ago. There's a new address for the radio station at UMass/Dartmouth, too: on Saturday morning, WSMU (91.1) signed on its new, more-powerful signal, WUMD (89.3) on Saturday morning - and after a brief simulcast period, the WSMU programming (a variety of student and community shows) will move permanently to WUMD. WSMU will then change hands, becoming the Bay State's newest outlet for the fast-growing "K-Love" religious network based in California. And we close our Massachusetts report this week with the death of Malcolm Soll, the DJ better known as "Austin of Boston." Soll began his career on Long Island, working at WLIR (92.7 Garden City), then moved into New York radio at WLIB (1190) and WKHK (106.7) before moving to Boston in 1987 to work at eclectic rocker WMRQ (103.3). When WMRQ became "Oldies 103" WODS the next year, Austin became its morning man, remaining there for a decade. He later worked at WROR (105.7), then spent seven years in morning drive at WSRS (96.1 Worcester). Soll, who was just 56, died June 5 of complications from a blood clot. He's survived by his wife, Grace, and three children. One format change in western PENNSYLVANIA: WUBZ (105.9 Phillipsburg) ditched its rock format early Friday morning, replacing "The Buzz" with country as "Joe FM" and sending "Chris and Jim in the Morning" packing, replaced by the syndicated Big D and Bubba show. Afternoon jock Jason "Fish" Miller is out as well. A station sale in CONNECTICUT: Candido Carrelo gets $425,000 for Bridgeport's WDJZ (1530) from Peoples Broadcasting Network. Peoples runs religion on WJSS (1330 Havre de Grace MD) and KTLD (1110 Pineville LA), so a format change from ethnic on WDJZ seems likely. Up in VERMONT, Steven Silberberg adds WFAD (1490 Middlebury) to his station group, paying Kathryn Messner's Lakeside Media $180,000 for the station. 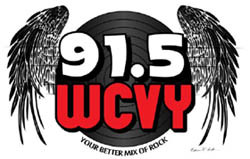 Silberberg also owns WXAL (93.7 Addison) nearby, as well as stations in Montpelier (WNCS/WSKI), Royalton (WRJT), Manchester, N.H. (WKBR) and Haverhill, MA (WXRV). South central PENNSYLVANIA is getting its first full-time commercial Hispanic station. All Access reports "Radio Omega," which has been running a micropower operation in Harrisburg, is now leasing WPDC (1600 Elizabethtown), replacing sports on the station midway between Harrisburg and Lancaster. Speaking of Harrisburg, there's word that Clear Channel will soon try again to replace the oldies on WWKL-FM (99.3) with its CHR "Kiss" format. The last attempt, last summer, was quashed by Citadel, which sued to enforce a non-compete that accompanied its purchase of established CHR WNNK (104.1). That agreement is apparently near expiration, so we're expecting to hear "Kool" on 99.3 for the last time when we drive through next weekend. The local radio industry thoughtfully waited to drop the latest bombshell until after your Radio Watcher had returned and unpacked, and it looks like this: After more than three years of tooth-and-nail fighting over Boston's country listeners, the war between Evergreen's WKLB (105.7) and Greater Media's WBCS (96.9) is about to come to an end. Just a few weeks after closing on the purchase of WKLB from Fairbanks Communications, Evergreen is trading the station to Greater Media in exchange for Greater Media's AC WEBR 99.5 Washington DC (the station known for years as WGAY-FM) and talker WWRC 980 Washington. The companies are announcing this as an even trade of the FMs, with an extra $22.5 million being added for WWRC. Greater Media says one of the Boston FMs will drop country after Labor Day, and odds are it will be WKLB, since WBCS still has a standing offer to pay a million dollars to the first listener to call in if they drop country before the end of 1996. WKLB general manager Bennett Zier exits after just a few weeks in town, to run Evergreen's new Washington operations. Here's where it leaves both groups: Evergreen keeps its prize Boston properties, CHR WXKS-FM ("Kiss 108"), CHurban WJMN ("Jam'n 94-5"), and standards WXKS 1430. In Washington, WEBR and WWRC get added to Evergreen's existing group, all-news WTOP 1500 and AC market leader WASH 97.1. (I'll leave it to Max Cacas and Bob Smith to speculate about whether Evergreen can finally turn around years of decline at WWRC...) Meanwhile, WKLB joins Greater Media's existing Boston stable, which includes WBCS, AC behemoth WMJX ("Magic 106.7"), and WMEX 1150, which is LMA'd to a foreign-language broadcaster. Assuming Greater Media keeps WBCS and drops country on WKLB, they'll have to look hard for a new niche format for 105.7. Unlike the situation a few years ago, when major format holes were a dime a dozen (no urban on FM, no country, no smooth jazz), the format plate is pretty full in Beantown at the moment. And of course, both Evergreen and Greater Media have been rumored repeatedly as targets of takeovers by fatter broadcasting groups like CBS/Westinghouse and Infinity. This ought to be a hot summer; stay tuned.